Bills from ProPath Services are generally for outpatient laboratory testing (such as biopsies and Pap smears) performed at your physician’s office or a surgery center as well as technical processing of specimens from other physicians or hospitals. Bills from ProPath Associates, our hospital-based pathology practice, are for the professional services relating to laboratory testing performed at various area hospitals. If you recently had a hospital encounter (either inpatient or outpatient), you may very likely receive a bill from ProPath as our pathologists direct several hospital laboratories. 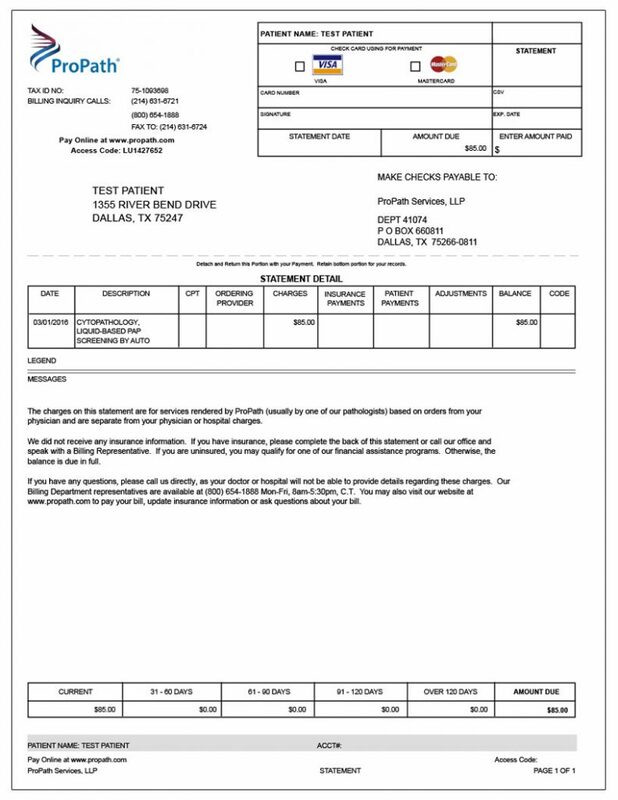 If your physician has requested a laboratory test (such as a biopsy or Pap smear) or consultation, you may receive a billing statement from ProPath. Initially, ProPath submits a claim to the insurance carrier identified by your physician or hospital. Once your insurance has processed the claim, you should receive an Explanation of Benefits from your insurance. This is NOT a bill. You do not need to pay anything until you receive a statement from ProPath. ProPath will forward a statement to you showing the application of any payments and insurance adjustments. The remaining balance may represent your deductible, coinsurance or the cost of non-covered services, and is your responsibility. In all cases, payment is due within 30 days from the statement date. Please remember that insurance plans have varying benefit levels and only you can be sure your insurance company processed your claim according to your plan provisions. If you feel your claim was processed incorrectly, please contact your insurance company. ProPath accepts checks, money orders, VISA or Master Card. PLEASE DO NOT SEND CASH AS PROPATH CANNOT ENSURE ITS SAFE DELIVERY. ProPath sends statements to you monthly. If there is new activity on your account (a payment from insurance, insurance denial, etc. ), an itemized statement will be generated and sent to you. Payment is required for your portion within 30 days from the date of invoice. For your convenience, ProPath offers payment access online. This service allows you to conveniently pay your bill online by using your VISA or Master Card. If you would like to make a payment by mail, write your account number on the check and send it with the payment coupon portion of your bill to the appropriate address listed below. For your convenience, an envelope was sent with your bill which allows for proper return of your payment. If ProPath is a non-network provider with your health insurance, you may receive payment directly from the health plan. 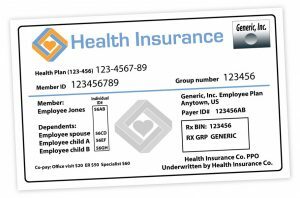 IF YOU RECEIVED PAYMENT DIRECTLY FROM YOUR INSURANCE, PLEASE ENDORSE THE CHECK OR SEND A PERSONAL CHECK ALONG WITH A COPY OF THE EXPLANATION OF BENEFITS (EOB) TO THE ABOVE ADDRESS. ProPath accepts VISA or Master Card payments via telephone. A physician referred your testing to ProPath. When specimens are received, ProPath prepares the specimen for review and a pathologist or other trained professional interprets the test results. ProPath then bills for these diagnostic services. In some cases, hospitals will refer a specimen for specialized consultation or staining procedures. ProPath performs screening and interpretation of gynecological testing (Pap smears). When requested by your physician, ProPath can also use your Pap specimen to test for the presence of HPV, Chlamydia or Gonorrhea and other STI diseases. When reviewing your Pap smear, if the preliminary results suggest a potentially abnormal reading, a pathologist will review the results. In this case, ProPath will also bill a separate charge for a pathologist’s interpretation. ProPath bills for the pathologist’s services when a patient is seen at certain area hospitals. There are generally two types of pathology services: anatomic and clinical. Anatomic charges are for services where a pathologist directly interpreted the result from a specimen (typically tissue). Most specimens are submitted to the hospital lab from a surgical procedure performed at the hospital. Clinical charges typically represent blood or urine specimens that are placed into machines for automatic processing. Charges for clinical pathology services are generally covered by the patient’s insurance policy as a reasonable and necessary medical service. Both the Federal Clinical Laboratory Improvement Amendments (CLIA) of 1998 and the Joint Commission on Accreditation of Healthcare Organizations (JCAHO) both require certain professional pathology services be provided in a hospital’s clinical laboratory to assure quality care for all patients. Medically reliable laboratory results are essential to the diagnosis and treatment of individual patients and require the oversight of a pathologist. Ensuring quality in all aspects of testing including collection of specimens and reporting of results. Selecting, evaluating and validating test methods. Ensuring that the physical plant and environment in the laboratory are appropriate for the testing performed. Ensuring that procedures are adequate to determine the accuracy, precision, and other pertinent performance characteristics of the test used. Ensuring that there is appropriate proficiency testing to validate laboratory procedures. Ensuring that appropriate corrective action is taken when results or controls are unsatisfactory. Ensuring that appropriate quality control and quality assurance programs are established and maintained. Ensuring that consultation is available to healthcare professionals relating to test interpretation. Advising the hospital concerning the number of employees and qualification of employees necessary for the proper performance of laboratory tests. Ensuring that all personnel have appropriate education, experience and continuing education to maintain a high level of quality. Ensuring that an approved procedure manual is available to personnel responsible for all aspects of testing and processing. Working with various departments and services to identify and provide testing appropriate to their needs. Assuring that the hospital laboratory is in compliance with state licensure laws, Medicare requirements, requirements of the Clinical Laboratory Amendments of 1998 and the Joint Commission on Accreditation of Healthcare Organization Program Standards. In the State of Texas, the pathologists are not employed by the hospital and must separately bill patients or their insurers for these professional services. Most insurance carriers in Texas recognize these professional activities as covered services. If, however, an insurance carrier does not cover these charges, the pathologist bills the patient for these medically necessary services. Call 214-631-6721 or 800-654-1888 and speak to a Patient Call Center representative Monday through Friday, 8:00 a.m. to 5:30 p.m. Central Time. You can now conveniently update patient information on our website at Update Patient Insurance. ProPath understands that sometimes families are under financial hardships. 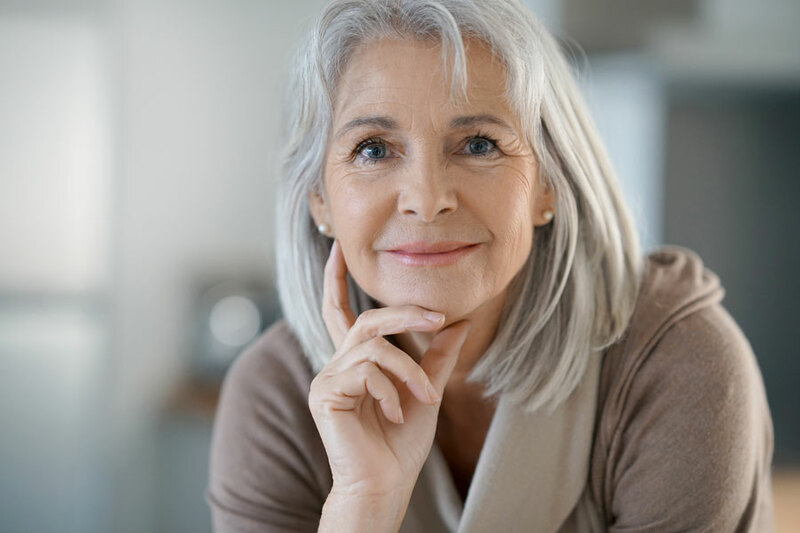 For this reason, ProPath has various payment arrangements available for patients with no insurance, limited coverage, or whose insurance may not cover the tests performed. To inquire about payment arrangements, please call: 214-631-6721 or 800-654-1888, Monday through Friday, 8:00 a.m. to 5:30 p.m. Central Time. Please complete our Financial Assistance Application to be considered for ProPath’s Assistance Program. Please CLICK HERE for the letter and form.